A woman awoke to find a 40-kilogram, five-metre (16-feet) python stretching from the lounge room to her bedroom while staying with her friend in far north Queensland, Australia. It is believed the Scrub Python, nicknamed Monty, has been living in the walls and ceiling of Trina Hibberd's Mission Beach house, south of Cairns, for more than a decade. But on what was a cold Monday morning, before dawn, a hungry Monty ventured out. 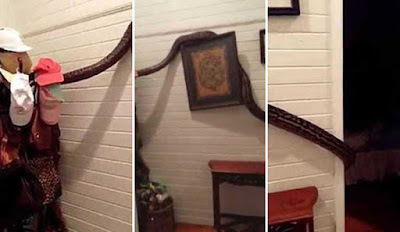 It slithered along the verandah, knocking a shoe off, then up the lounge room wall, flicking the light switch on, and then into a bedroom, where it knocked over a lamp. Ms Hibberd's friend Julie Birrell woke up, raising the alarm. "All hell broke loose," Ms Hibberd said. The women filmed the beast sprawled across the home, stretching across the lounge room wall and into the bedroom. They trapped it in the room and called the snake catcher at 4:30am. While this was a rude awakening, it was not the first time the reptile had made an appearance. Ms Hibberd said she first saw it 15 years ago, when it poked its head into the bathroom when she was having a shower. 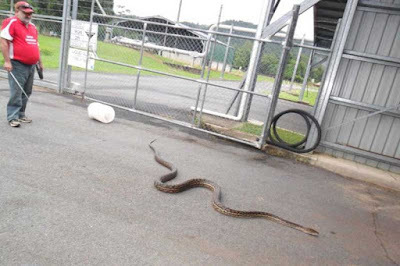 "We knew the snake was there but I had never seen it inside, not that I know of," she said. "I've never seen it in its full length." 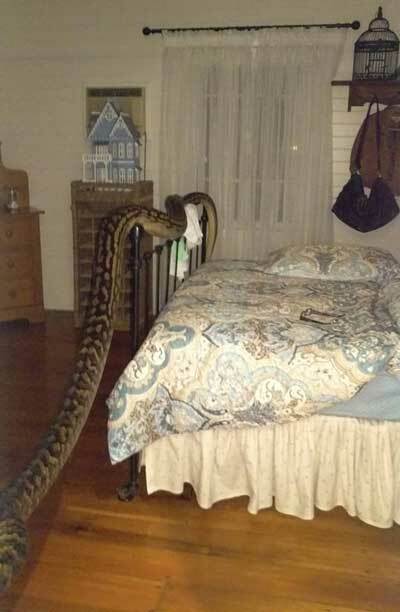 Monty was still in the bedroom when snake catcher Dave Goodwin arrived. "We walked into the bedroom and it was hanging from the curtain drapes down to the bedside table - and that was only a third of him," he said. "It was a good monster. We locked ourselves in the bedroom and grabbed him around the neck. He coiled around my arm but we managed to put him a container." It is the second biggest snake Mr Goodwin has seen in his career. Monty was released into a local water treatment plant, which backs onto native bushland. You can see video of the f*cking huge very big python here. (Contains NSFW language).